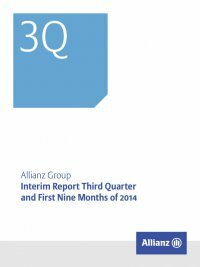 Interim Report Third Quarter and First Nine Months of 2014 Allianz Group24 Acquisition and administrative expenses (net) amounted to € 1,488 mn, an increase of € 166 mn. This was primarily a result of higher expenses and higher deferred acquisition cost amortization in the United States compared to last year. Higher administrative costs, mainly related to the entities transferred from the business segment Asset Management, further contributed to this increase. Margin on reserves dropped from 66 to 61 basis points. Excluding the effects of the allocation of the former Asset Manage­ ment entities, operating profit was broadly flat. While we saw an increased investment margin as well as higher loadings and fees, higher expenses and a lower technical margin offset this positive effect. The improvement in our investment margin (i.e. investment income, net of hedged item movements and policyholder participa­ tion) was driven by gains from the duration strategy as well as a recovery in the foreign currency result in Germany. The higher asset base in the United States also contributed to this development. Load­ ings and fees increased mainly as a result of sales increases in Ger­ many and Asia-Pacific. We recorded higher expenses, mainly due to increased acquisition expenses in line with volume growth. 2014 to 2013 first Nine Months comparison Operating profit increased by € 362 mn to € 2,655 mn. This was mainly driven by the improved operating investment result, which was bur­ dened by higher losses from the net of foreign currency translation effects and financial derivatives in the second and third quarter of 2013. In addition, the allocation of certain entities previously reflected in the business segment Asset Management to the business segment Life/Health contributed € 85 mn to this increase. Net income 2014 to 2013 third quarter comparison In the third quarter of 2014, net income decreased by € 32 mn to € 530 mn. This was mainly due to higher non-operating expenses because of a risk capital hedge in the United States and to a lesser extent higher taxes more than offsetting the operating profit growth. The effective tax rate amounted to 31.6 % (3Q 2013: 29.3 %). 2014 to 2013 first Nine Months comparison The strong operating performance in the first half year was the main driver for the increase of € 227 mn to € 1,891 mn in the first nine months of 2014. The effective tax rate was 29.9 % (9M 2013: 29.8 %).